The camera is in no hurry as the poet Young-wan (Ki Joo-bong) changes out of his checkered pyjamas and puts on his pants with ease. Outside, the river looks like a white sheet amidst all the snow, as the dark edges of the railing of his verandah stand in stark contrast. It is winter and he is living in a hotel; his sons call, wanting to meet him, but he doesn’t want them to come to his room. He proceeds to put on a hat and coat and walks down to the hotel coffee shop. The waitress recognises him and starts chatting with him right away. 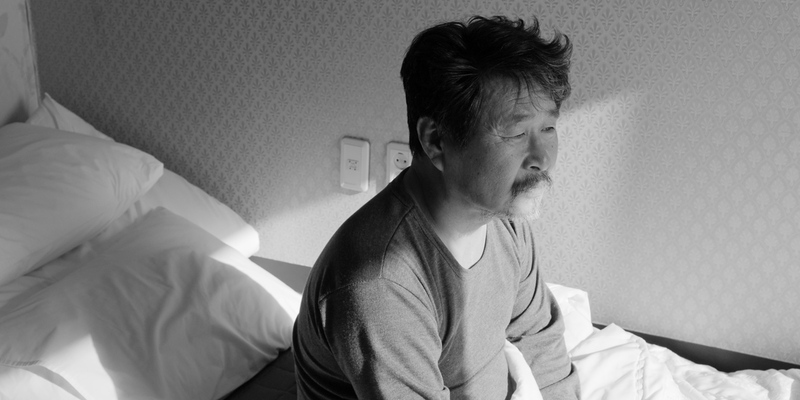 There is a slow ease with which the melancholia in Hong Sang-soo’s Hotel by the River (2018) sets in, aided by Kim Hyungkoo’s trademark crisp, black and white cinematography. Young-wan tells his sons that he has been having bad dreams and has a premonition that he is going to die, thereby setting forth the themes of death and loss that pervades through the film. In another room in the hotel, Sang-hee (Hong muse and regular collaborator, Kim Min-hee) lives and tries recuperating from a breakup. The two lead characters and their stories never really conjoin beyond fleeting social interactions, but peacefully meander along parallelly in the narrative. In contrast to Young-wan’s complete refusal to let his sons into his room, Sang-hee wants her friend, Yeon-ju (Song Seon-mi) to come into her room with coffee and some cake. There is a difference in the loneliness the two characters feel. Young-wan is convinced he is going to die, his loneliness comes out of the final realisation of his own mortality. There is nothing beyond that feeling and he tries to make amends with his sons before the end he is certain of. His former wife hates him and deems him to be the worst human being on earth. At the end of his life as a seemingly successful poet, he doesn’t have a family to call his own; This is a loneliness he can’t make better and has to surrender himself to. Sang-hee, on the other hand, is young and beautiful. She lets in her friend to help her deal with her heartbreak, allows her to come into her world with coffee and cake that will make her feel better. They drink wine and talk about her recent relationship. “I am at peace,” she says before looking out of her window, “The magpies are building their nest. How impressive, in this cold!” she adds. One senses hope in her voice and a resolve to combat this loneliness that has presently taken over her life. In what is now a trademark Hong Sang-soo scene, the three men sit together at a table drinking their coffee; the two sons, Kyungsoo (Kwon Haehyo) and Byungsoo (Yu Junsang), on one side and Young-wan on another. The tabletop is sparkly clean and reflects the men with the snowy riverside behind them. There is a curtness to the seating that reveals a fear of intimacy of both sides. They’re all hiding secrets and keeping things from each other. The women, on the other hand, are drinking wine, talking, lying down next to each other, hugging each other in sleep and moving around in comfortable, intimate and fluid movements. They look out into the snowy expanse and talk of puppies, magpies and the snow while the two brothers sit engrossed in their phones, oblivious of the world outside. “I will tell you everything,” Sang-hee tells her friend. There is obviously a breakdown of the father-son relationship between Young-wan and his sons; though the father chooses to side with the older one, there is more of him in the younger filmmaker son, Byung-soo. He makes art films: “It’s an ambivalent film—he is barely an auteur,” Yeon-ju says of him. “Sounds boring,” chimes in Sang-hee. This is one of the many self-references and self-reflective jibes that pepper through most of Hong Sang-soo’s films. Hotel by the River is an ambivalent film. It meditates on the melancholy of the liminality one feels when one has reached the end of one’s life. For an artist-poet, this is not just the end of living but also the end of creating, the end of absorbing the beauty that surrounds the everyday mundaneness of life, a beauty that Hong Sang-soo is an expert in capturing. At the same time, the film also meditates on love, heartbreak and the possibility to emerge out of loss through friendships and relationships that pull one out of distress. Hong Sang-soo, as always celebrates the universality of love and emotions that connect people across ages, genders and, in some films, across continents. When Sang-hee and her friend stand slender and tall in their black coats against the still whiteness of the snow and a dead tree, they look like a “sublime painting,” as Young-wan notes. They hold hands and exclaim at the snow, “The snow fell for us!” Keeping his sons waiting, Young-wan walks up to the women, drawn by their beauty, and in trademark Hong Sang-soo style, compliments them on their beauty over and over again. It is perhaps a finite sense of beauty that a dying poet appreciates, knowing that his days of experiencing it are numbered. “Let me write this down,” he says. We all reach for our pencils. Symmetry and Mirroring in The Shining.